Do something with your dog!! This month januari 2016 makes the 100th anniversery of the story of Lad. Exactly 100 years ago Albert Payson Terhune's story His Mate is printed in Red Book Magazine. 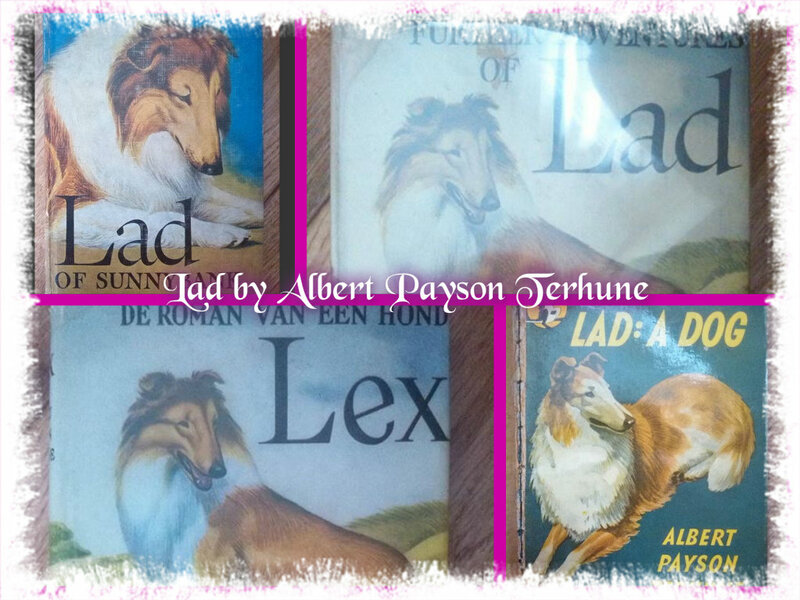 Before those dogyarns he wrote many mysteries and other tales, but when His Mate was published with Lad the great collie with the absurdly tiny forepaws, the fame of Albert Payson Terhune began to rise. Who would have know that a tale about a dog could make someone famous, but for many Americans it was a reason to want a collie, and there are a huge amount of breeders and owners of collies that love the book Lad a dog, and they will state it was their start in the breed. The book Lad a dog came later, that was not published earlier then in 1919, the story's of Lad first only where printed as serials in magazines, and later they where being bundled up in a book. Lad a dog is still in print today, so that is very nice. Als because the stories are so old, many books of Terhune are online because they are public domain now. Another great book, and I happen to be the lucky girl who has both of her books. It is the same, but the small one is the first one she published and the larger one is the new revisited one. Why is this book a great one??? Well this one will explain with picutres to go with it, how the ideal collie should look. All parts of the collie come along while you read this book. Headtypes, what is a perfect shape of a head, what is acceptable, and various faults, in bigger and lesser degree. But also how angulation needs to be in front and back, and what is an acceptable tail! I think that it is very nice that all ellements come in to vision with many drawings, because while explaining a form in letters, it is far more easy to see for youselve on a picture. Many beautifull drawing from the hand of Mia are in this book, she really knows how to capture the beauty of the collie and make the standard of our breed into vision. I'm so sorry for not posting for a while but sometimes there are so many other things to do, and I need to go to work to get my money so it's been a while. But now I want to share again a very very nice book I got. I had it as a present from one of my best friends, and mentors in the collie breed. This book is about a Rotweiller and it's called Mijn vriend Rik, by Jan van Rheenen. At first I tought why I wanna read a book about a Rotweiller, but I have a very cool colliebook by the same writer, and it wasn't the largest book with the most pages, so I started reading it. You wouldn't believe how quick I finished this book, the story is so great told, this man can really write a book you get hooked on (if you like dogbooks) when I finished it, wat was within 2 days I found it like I read some Terhune story but then with another breed and another language. This book brings so many nice memories. It is Rough collies of Distinction by Pat Hutchinson, Iris Combe and Dareen Bridge. I bought it on my very first trip to crufts in the beginning of the 2000's, not sure when I went there for the first time. The book is a hardcover one, with a lovely dust jacket. De collie on the cover is Freelander Phrosty moon over Corydon, I hope I spelled his name right, a really lovely collie, and I had the honour to see this marvelous dog in real at crufts. His colour was so striking and his bone, wow. I could go on about Crufts and that dog, but I'm talking here about the book. As I said a hardcover with dust jacket, the size is nice, it is a coffeetable book but not very large, so you can sit with it on the sofa and have it nice on your lap.